El Audi Q8 Concept se acerca mucho al modelo de producción. Allí donde esté una de las marcas Premium alemanas, las otras dos acudirán raudas a iniciar la batalla comercial. En el caso de los grandes SUV cupé, BMW dio primero con el X6, Mercedes-Benz le siguió con el GLE Coupé y, ahora, el Audi Q8 Concept muestra las claras intenciones de la marca de los cuatro aros en este nicho de mercado. ¿El beneficiado? Como siempre, el cliente, que podrá elegir entre tres alternativas de primera. Centrándonos en el prototipo, presentado en el salón de Detroit, parece que se acerca mucho al modelo de producción. Será la primera incursión de Audi en este segmento de los todocaminos con apariencia cupé, donde, en principio, aterrizará de forma oficial en 2018. 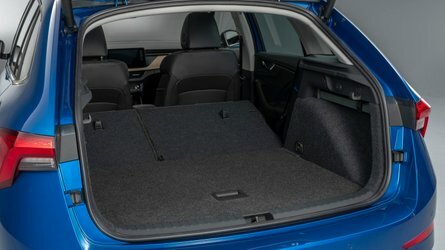 Lo hará con un coche de aspecto dinámico, que integrará las últimas soluciones estéticas de la firma, y con un habitáculo de cuatro plazas. Una parte muy interesante del ejercicio de estilo tiene que ver con la tecnología, ya que presenta el sistema de proyección de información en el parabrisas Head-up Display de mayor tamaño en la automoción, hasta el momento, y una nueva versión de la instrumentación digital Audi virtual cockpit, con gráficos de mayor resolución y más funciones prácticas. Casi con toda probabilidad, estas soluciones estarán a disposición del cliente en el vehículo de calle. Lo mismo que sucede con las llamativas llantas de aleación, de 23 pulgadas, o los discos de freno carbocerámicos. Otro aspecto destacable es la suspensión adaptativa, con dos posiciones y 90 milímetros de diferencia entre ambas. En el habitáculo, destacan el salpicadero sin botones físicos y los cuatro asientos individuales. Gracias a una distancia entre ejes de 3,0 metros, el espacio para las piernas debería ser óptimo en cualquiera de las plazas. Queda la duda de saber cuánta altura libre al techo queda en las traseras. Lógicamente, debería ser menor que en un Q7, lo que limitaría el uso de las mismas a adultos de talla media. En el Audi Q8 Concept, la propulsión corre a cargo de un módulo híbrido enchufable. 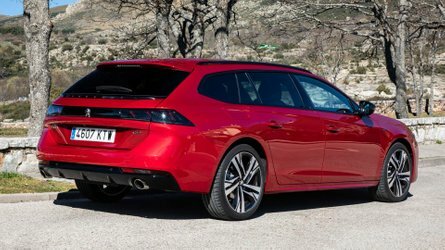 El motor de combustión elegido es el de gasolina turboalimentado 3.0 TFSI, con 3,0 litros de cilindrada y 333 CV, que complementa a otro eléctrico, de 136, gobernados a través de la transmisión automática con convertidor de par tiptronic, de 8 velocidades. En conjunto, el sistema desarrolla una potencia máxima combinada 443 CV y un par de 700 Nm, al tiempo que consume solo 2,3 litros cada 100 kilómetros en ciclo mixto homologado. La batería del conjunto usa iones de litio y tiene una capacidad de 17,9 kWh. 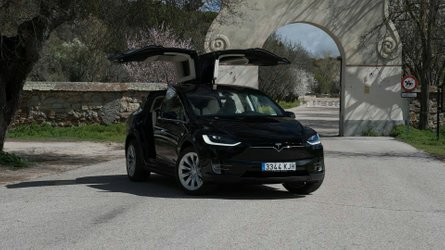 Con ella, el coche puede desplazarse durante 60 kilómetros solo con el propulsor eléctrico. La recarga rápida puede completarse en dos horas y media, a través de una toma de corriente de 7,2 kW, según explica Audi. Recordemos que este prototipo cuenta con tres programas de conducción: EV, hybrid y battery hold. Los propulsores se encargan de mover a los dos ejes. 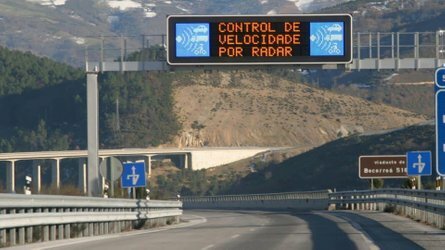 De este modo, el modelo se beneficia de la tracción total quattro, con la que se debería lograr una mejor dinámica y una mayor seguridad, en cualquier circunstancia y terreno. 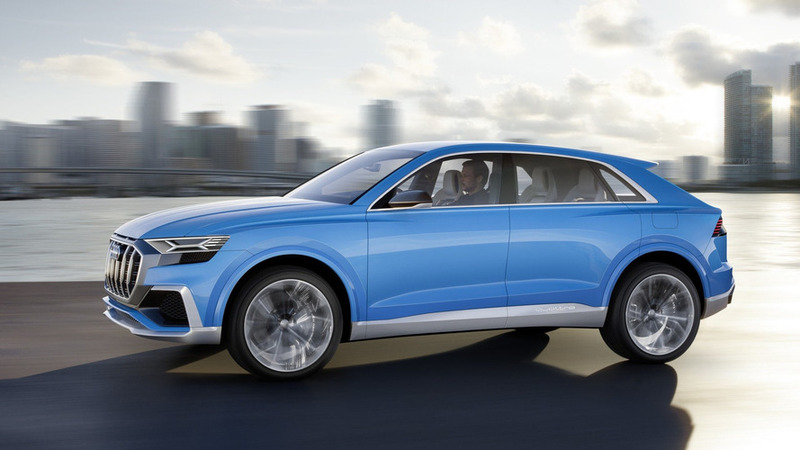 En relación con este punto, el maletero del Audi Q8 Concept promete 630 litros de capacidad, 260 menos que en el Q7, si bien resulta suficiente para la mayoría de desplazamientos con la familia. Dynamic, highly efficient and extremely comfortable: Audi presents the Audi Q8 concept at the North American International Auto Show (NAIAS) 2017. With this model the premium manufacturer is tapping into a new segment for the full-size class – an elegant alternative to the robust presence of a classic sport utility vehicle. The Q8 concept stands for maximum prestige. It combines the spaciousness typical of an SUV with the emotional lines of a coupe. Propulsion is provided by a powerful, yet highly efficient plug-in hybrid with 330 kW of system output and 700 Nm (516.3 lb-ft) of torque. The concept car is the basis for a production model that Audi will launch on the market in 2018. At 5.02 meters (16.5 ft) long, the Audi Q8 concept is an impressive presence in the full-size class. Thanks to a wheelbase of three meters (9.8 ft), the show car offers plenty of space for passengers and luggage. Despite the sloping, coupe-like roofline, even the rear-seat passengers enjoy ample head and shoulder room. The control concept uses large touchscreens in the cockpit and is rounded out by an expanded version of the Audi virtual cockpit and a contact-analogue head-up display. The latter uses intelligent augmented reality technology that merges the real and the virtual worlds. The front view of the 2.04-meter-wide (6.7 ft) Audi Q8 concept is already impressive. The distinguishing feature here is the octagonal Singleframe with honeycomb insert. It is sculpted and significantly wider than in today’s Audi production models. Six upright double bars structure the radiator grille while simultaneously emphasizing its height. A mask painted in a contrasting color frames the grille. The outer air inlets have a deep and dynamic appearance like the intakes of a turbine. A distinctive aluminum blade forms the bottom edge of the bumper. 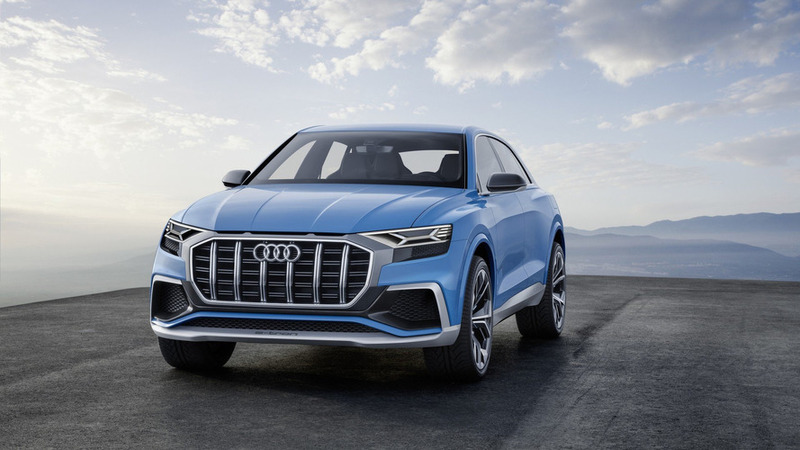 The flat, wedge-shaped headlights of the Audi Q8 concept are integrated progressively into the exterior and connected from a design perspective to the surrounding air inlets. The individual lighting units have glass covers, but the headlights as a whole are open. This creates the impression that they are free in space. The aluminum housing for the headlights carries over the sculpture of the Singleframe. The clear geometry gives the Audi Q8 concept a determined look. An x-shaped, blue laser light signature highlights the digital Matrix laser technology used for the low and high beams. Broken down into more than one million pixels, their light can illuminate the road in high resolution and with precise control. Located below the edge of the engine hood is a narrow LED light guide that emits the light for the dynamic turn signals and the daytime running lights. It wraps around the outside of the headlights, where its ribs create an innovative e-tron signature. All lighting functions are dynamic. The silouhette of the Audi technology study also evokes tautness. The doors do not have window frames, thus contributing to the flat roofline. 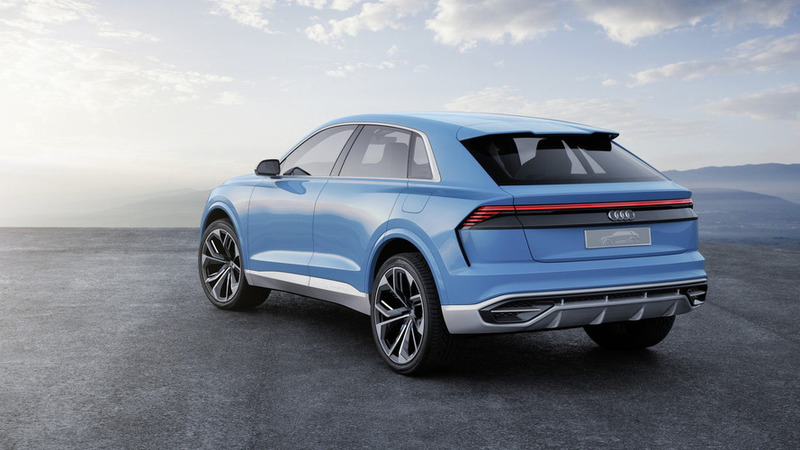 The Audi Q8 concept is 1.70 meters (5.6 ft) tall. All lines on the body climb upward dynamically toward the rear – the bottom edge of the side window, the shoulders, the dynamic line and the sill lines. The surfaces of the fenders, doors and side panels are athletically curved. The lower section of the doors form a deep fillet. Other design features are the quattro logo milled below the rear doors and also the exterior mirrors with their multifaceted edges. The doors are opened via touch sensors. As soon as the door detects hand contact, it opens easily and swings to a defined opening angle. brushed aluminum for an intriguing contrast to the show car’s Bombay blue paint finish. A long roof edge spoiler shades the extremely flat rear window of the Audi concept car. A double spoiler lip below the window forms a distinctive contour on the power luggage compartment hatch. The strip of lights extending over the entire width of the rear end is part of a distinctive e-tron light signature. It serves as both the tail and brake light as well as the dynamic turn signals. The four outer lighting elements are set in aluminum blades and reflect the semantics of the headlights. The individual elements of the tail lights are also open, and all lighting functions are dynamic. 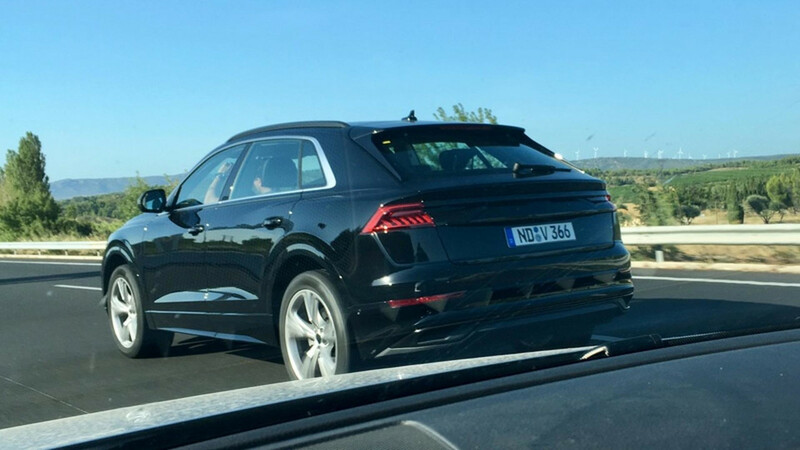 The license plate of the Audi Q8 concept is located on a black trim strip between the lights – a typical feature of the Audi Ur-quattro. The diffuser is made of aluminum; its clasp of high-gloss Carbon Atlas. This combination of materials is also used around the headlights to demonstrate sportiness. The interior of the Audi Q8 concept offers opulent spaciousness for four persons and their large suitcases. The luggage compartment has a capacity of 630 liters (22.2 cu ft). Widely stretched lines lend the cockpit a sporty as well as elegant ambiance. Virtually floating above the center tunnel is a console for the shift-by-wire lever, with which the driver controls the eight-speed tiptronic transmission purely electronically. The console’s appearance resembles the stern of a sailing yacht. The wrap-around begins in the front doors. This large, horizontal arc runs along the lower edge of the windshield and frames the driver’s and front passenger’s seats without hemming in the occupants. The sport seats as well as the two individual seats in the rear are made up of segments that appear to be separate geometric bodies, from the pronounced side bolsters to the head restraints. A horizontal aluminum clasp divides the backrests at the height of the window shoulder line. a graphical quattro badge. The arrow-shaped inlays in the doors pick up the expressive design. Filigree aluminum bars integrated into them serve as door openers. When dark, LED light guides illuminate the interior with white light. The colors and materials in the Audi A8 concept provide for a cool and sporty atmosphere. One highlight is the three-dimensional, engineered grain on the instrument panel, doors and floor. High-gloss carbon applications with a new, abstract fabric structure as well as aluminum strips and frames set accents. Their brushed finish is relatively dark. Brightness increases gradually from the headlining to the center console in graduated shades of gray from steel gray to pastel silver. The technical materials in the Audi Q8 concept contrast with the soft surfaces. The seats are covered in a combination of Fine Nappa leather and Nubuk leather, both in pastel silver. The upholstery is pulled around the clasp that divides the backrests – the inside becomes the outside at this point. The head restraints are covered with a structured textile of a color similar to that of the leather elements. The elegant interior architecture of the Audi Q8 concept merges with a groundbreaking control and display concept. Information and commands are passed primarily through touch displays augmented by the Audi virtual cockpit and a contact analogue head-up display. All displays feature a new “digital design” that concentrates systematically on the most important things. The contact analogue head-up display projects important displays onto the windshield in the driver’s direct field of view, seemingly placing them in the real environment. A navigation arrow, for example, appears in the same position as an actual arrow on the road – an intelligent application of augmented reality. The notifications from the driver assistance systems also merge the virtual and physical worlds. The Audi virtual cockpit future is even more dynamic thanks to new functions, and with a resolution of 1920 x 720 pixels displays graphics with more detail than ever before. In “auto” display mode, the 12.3-inch TFT display offers generous space for maps, lists and additional information. The top-down map view visualizes the selected route. When zooming in, the current position and surroundings are displayed in 3D. Through the buttons on the steering wheel, the driver can switch to “performance” mode. The needles of the speedometer and powermeter now appear in a foreshortened, three-dimensional display. All other monitors in the Audi Q8 concept are touch displays. The great strength of this principle is the direct, fast and intuitive operation. Drivers select each function exactly where they see it. Audi was also able to reduce the number of buttons, switches and levers thanks to the touchscreens. The interior now appears even neater and cleaner. The MMI monitor in center of the dashboard is used to control the infotainment system and for vehicle settings. A display for the climate control system is integrated into the diagonal section of the center console. The driver’s wrist rests comfortably on the low selector lever of the eight-speed tiptronic while using this display. If the sensors in the seat detect a front-seat passenger, the touchscreen displays their climate control settings. This function is not available when the driver is traveling alone. Another touchscreen is reserved for the lighting functions. The Audi Q8 concept uses production technologies for the drive system and suspension. Their use in the study demonstrates their importance once again. The plug-in hybrid combines sporty performance with high efficiency. The combustion engine is a 3.0 TFSI producing 245 kW (333 hp) and a maximum of 500 Nm (368.8 lb-ft) of torque. The electric motor generates 100 kW of power and 330 Nm (243.4 lb-ft). Together with a decoupler, it is integrated into the eight-speed tiptronic. The complete system produces 330 kW and 700 Nm(516.3 lb-ft) of torque. The Audi Q8 concept accelerates from 0 to 100 km/h(62.1 mph) in 5.4 seconds on its way to a top speed of 250 km/h (155.3 mph). According to the standard applicable for plug-in hybrids, it consumes just 2.3 liters of fuel (102.3 US mpg) per 100 kilometers (62.1 mi) in the NEDC, corresponding to 53 grams CO2 per km (85.3 g/mi). The lithium-ion battery located in the rear consists of 104 prismatic cells. With a capacity of 17.9 kWh, it enables an electric range of 60 kilometers (37.3 mi), and the total range with the TFSI engine is up to 1,000 kilometers (621.4 mi). A full charge with 7.2 kW output takes about two and a half hours. When driving, the hybrid management system controls the operating states of the Audi Q8 concept intelligently and flexibly. The full-size SUV can boost, coast and recuperate as appropriate for the situation. The predictive efficiency assistant, which in production models supports the driver, provides the hybrid management system with highly detailed information about the near surroundings for this purpose. Route data from the navigation system and Audi connect Car-to-X services are also considered. 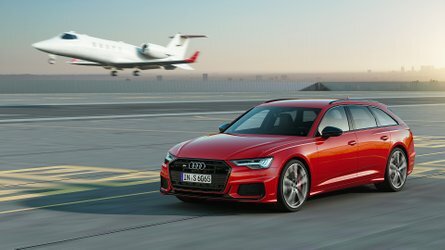 The driver controls the Audi drive select system via a prismatic satellite button on the flat-bottomed steering wheel, just like the start-stop system. There is a choice of three driving modes: “EV” mode prioritizes electric driving, while in “hybrid” mode the decision regarding the drive type is left largely to the hybrid management system. In “battery hold” mode, it saves the available electric energy for a later time. In the Audi Q8 concept, the quattro permanent all-wheel drive system delivers the power of the hybrid drive to the road with supreme control. At the cornering limit, it works closely with the wheel-selective torque control. This minimally brakes the inside wheels, which further enhances dynamics and stability. The technology study also uses high-end production solutions for its wide-track suspension. The adaptive air suspension sport – an air suspension system with controlled damping – allows a wide range from cushioned cruising to firm and tight handling. In addition, it sets the ground clearance in two levels, with 90 millimeters (3.5 in) height difference, to the ideal level in each case. The front and rear suspensions are engineered as lightweight five-link designs. Audi mounts 305/35-series tires on the large 11J x 23 wheels. The five intertwining Y spokes project a filigreed, three-dimensional and powerful image. Ceramic brake discs measuring 20 inches in diameter effortlessly decelerate the Audi Q8 concept.